Today’s Special: Get 21% Cashback on your recharge & bill pay! 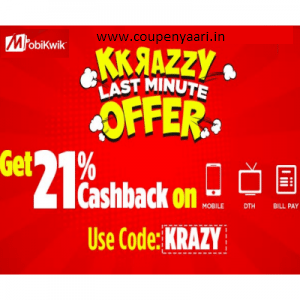 (Select Users|Non-Airtel) Mobikwik Cashback Loot Offers KKRAZZY Last Minute get 21% cashback on Rs. 10 & above on Recharge, Bill Pay, DTH or utility payments on MobiKwik App. Not valid for Airtel users. Valid only for select users. Use code KRAZY and get 21% cashback on Recharge, Bill Pay, DTH or utility payments on MobiKwik App. The Maximum extra cashback is fixed at Rs.111. Coupon Redemption and Payment should be done on MobiKwik’s Android, iOS & Windows App(version 10 & above). Users who have redeemed the code SUMMER, KWIK10, KWIK15 or MOBI40 are not eligible for this offer. MobiKwik reserves the right to end any or all offers at it’s sole discretion without any prior notice. How to get cashback on Mobikwik?